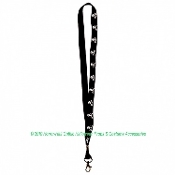 BLACK with WHITE SKULL BONES PRINT LANYARD CELL PHONE NECK STRAP KEYCHAIN or I.D. HOLDER with attached swivel clip. Gothic and Pirate Lovers Phone Accessories. Poison Theme Pirate Skull design with eyepatch. -Recommended for ages 5 and up. -Great for holding keys, ID badge, etc.